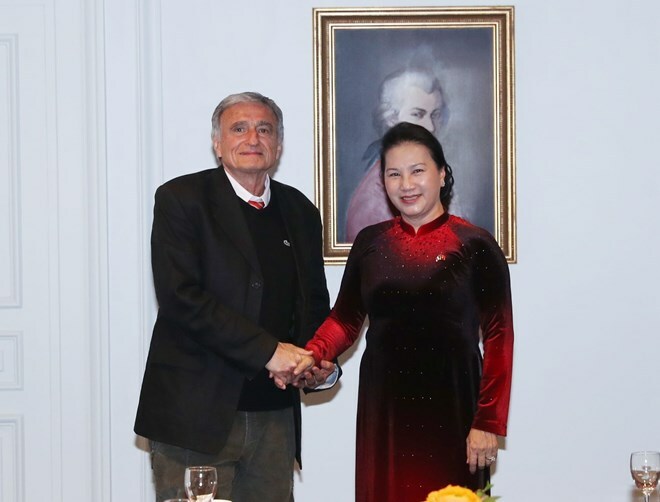 Paris (VNA) – National Assembly Chairwoman Nguyen Thi Kim Ngan met with Secretary-General of the France-Vietnam Friendship Association Jean-Pierre Archambault in Paris on March 31, part of her official visit to the European nation. The top legislator of Vietnam noted with satisfaction that the two countries’ friendship has been developing strongly, especially since they set up the strategic partnership in 2013. She affirmed that Vietnam always attaches importance to its relations with France in its foreign policy, and it hopes the two sides will continue enhancing bilateral cooperation. The extensive relationship, which dates back hundreds of years with the two peoples’ cohesion, illustrates the strong commitment of the countries’ leaders and peoples to developing their relations sustainably. Archambault also expressed his delight at the thriving relations in multiple spheres, including frequent mutual visits by the two sides’ leaders. He noted that the France-Vietnam Friendship Association was set up in 1961, when Vietnam began the resistance war against the US, so as to show the friendship and solidarity with the Southeast Asian country. Since then, it has maintained connection with organisations in Vietnam, the Vietnamese Embassy in France, and the French Embassy in Vietnam. The association’s activities currently focus on popularising information about Vietnam to the public in France, strengthen the solidarity with the Vietnamese people, and contribute to the two countries’ relations. Notably, it has published an exclusive magazine on Vietnam, the Secretary-General added. Chairwoman Ngan highly valued activities of the France-Vietnam and Vietnam-France friendship associations, noting that people-to-people exchanges are an important channel helping to promote the friendship and cooperation between the two States and peoples. She underlined that cooperation between Vietnamese and French localities has become an important part in bilateral ties, helping with the countries’ traditional friendship and multifaceted collaboration. She asked both sides to coordinate closely to successfully organise the 11th decentralised cooperation conference in France’s Toulouse city this time and the 12th event in Vietnam’s Hanoi capital next year. The legislator also asked the France-Vietnam Friendship Association to continue having a voice in the support for Vietnamese people’s organisations in France and advocate the preservation of the Vietnamese culture and language in the Vietnamese community in the country.